This composite image shows a superbubble in the Large Magellanic Cloud (LMC), a small satellite galaxy of the Milky Way, located about 160,000 light years from Earth. 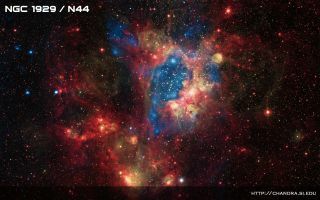 This composite space wallpaper shows a superbubble in the Large Magellanic Cloud (LMC), a small satellite galaxy of the Milky Way, located about 160,000 light years from Earth. Many new stars, some of them very massive, are forming in the star cluster NGC 1929, which is embedded in the nebula N44. The massive stars produce intense radiation, expel matter at high speeds, and race through their evolution to explode as supernovas. The winds and supernova shock waves carve out huge cavities called superbubbles in the surrounding gas. X-rays from NASA's Chandra X-ray Observatory (blue) show hot regions created by these winds and shocks, while infrared data from NASA's Spitzer Space Telescope (red) outline where the dust and cooler gas are found. The image was released Aug. 30, 2012.